COST // Outsourcing the work will definitely decrease the resource cost and other expenditures such as Recruitment, infrastructure cost, utility bills and salary. You don’t have to worry about work spaces and software required for development. Just hire a web development company in India for reasonable rates and get your work done. QUALITY // Software development companies in India have tough competition amongst themselves. Market competition controls business in a big way, companies can’t really sustain until they stay in demand and thus they are under constant pressure to deliver excellent quality results. So you can be assured that quality will be top notch. TECHNOLOGY // Once again the competition plays a big role here, Software development companies in India have to make sure they have all the latest equipment, resources that are up to date with the latest technology. TIME // Outsourcing development services saves you from lengthy hiring processes. Hiring, training and managing a team of developers is a process that takes weeks if not months. Outsourcing gives you time to focus on your primary business activities whereas outsourcing company in India manages other business processes. This model is benefitian for anyone who wants quick changes to their website or one who wants to check skills of our developers before awarding any project. Less cost compare to hourly model. If you have any specific module to be develop which should take more than 40 hours, than this model is perfect for you. You will get 4 hours of project manager free. 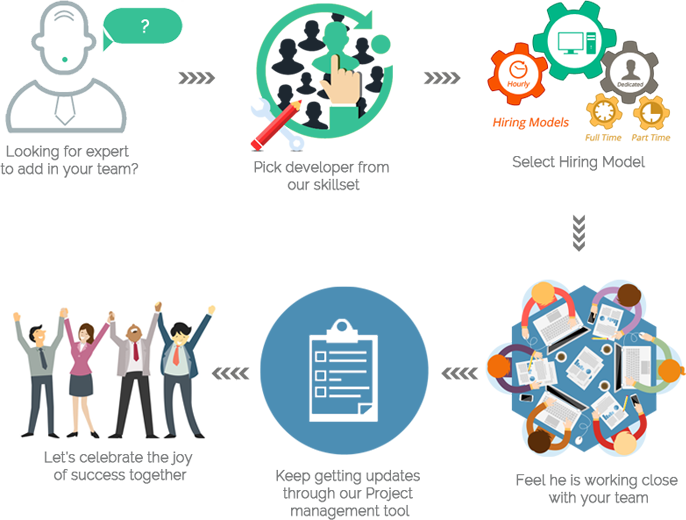 This model is best if you want to expand your team, or want to create new team of developers at affordable price without any setup and infrastructure cost. You will get one week demo free. Also you will get 20 hours of project manager free.